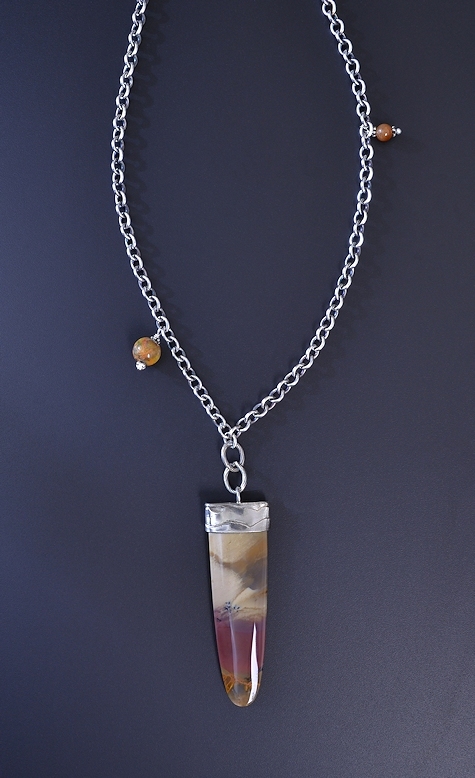 A beautiful pendant on a long, heavy sterling chain which can be wrapped twice if you prefer. The pendant is beautifully cut, highly polished on all sides, domed to a narrow edge all the way around making it feel luxurious. The colors are exquisite, with swirls of Pantone's 2015 color of the year, marsala, in the lower half. There's even a tiny dendrite tree in it. Unfortunately I didn't get the location where this stone was found or any idea of what kind of tree it might have been. You must understand, when GJX opens in Tucson there is a veritable feeding frenzy with customers stacked several deep all the way around Gary's 20' square booth. It's virtually impossible for me to hold my pack, balance trays, keep from stepping on anybody, grab Gary's attention, and make notes... so we are left with the question of what type of plant this was. In fact, it may be that no one knows. There is a detailed and fascinating article by Jim Landon in the July 2015 issue of Rock & Gem about identifying petrified wood, you might want to check it out if you have an interest. Interestingly, petrified wood appears as the subject of six essays in Within the Stone (below), matched only by six of Pietersite (I made a little list for myself since there's no index... am I the only one who makes my own index or adds to the existing one when I read a book?). 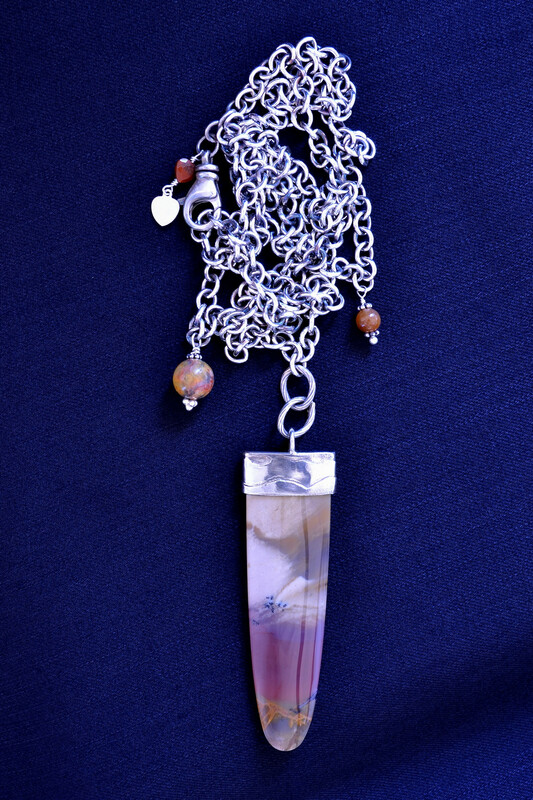 Most of the stones appear only once or twice, Zenz' favorite agate, Laguna, isn't even included once. At any rate, Bill Atkinson includes six spectacular images of petrified wood all wildly different and unlike any I've ever seen. I almost always wear a Navajo bracelet likely made during WWII which belonged to my Mom. Instead of turquoise (which went into the war machine's maw for copper during that time) the bracelet has a beautiful piece of petrified wood. It blends with every piece of clothing I have and I'm very grateful to have it. I've learned a lot by studying how that bracelet was made. The petrified wood is so hard it has never been scratched despite years of wear. 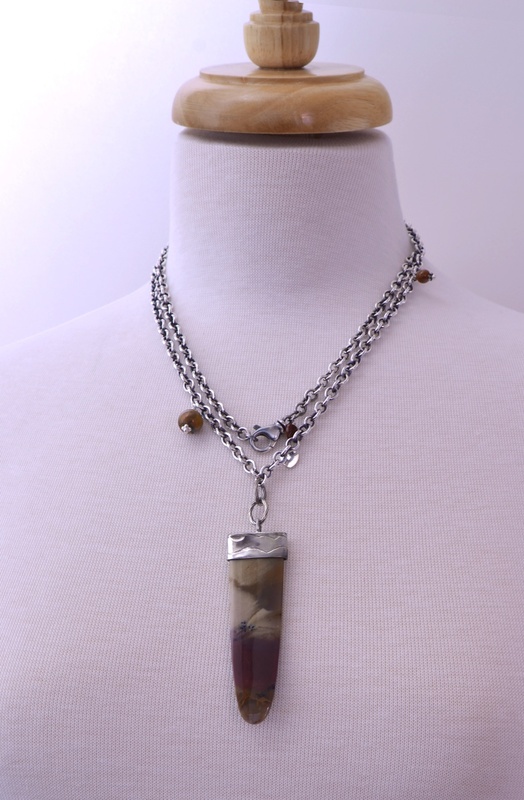 Ahsian says, "Petrified Wood is a stone of roots, beginnings and ancient knowledge..." Perhaps that's the real reason I wear it. I hope you will enjoy this necklace! If you would like for me to shorten the chain, please let me know.